Living in Playa del Carmen means enjoying the nature accompanied by a very quality level lifestyle and letting yourself be immersed in the natural beauty of its surroundings. Valenia, a development of exclusive residential lots, found only 10 minutes from the beach, with 12 private areas, lots from 230 m2, more than 15000 m2 of green areas, controlled access with 3 entrances and security 24hrs of the day. 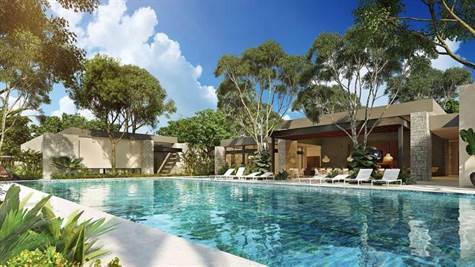 Clubhouse: reception, semi-olympic pool with 3 lanes, kids pool, rooftop with a bar, area with sunbeds, gym, soccer field, paddle court, tennis court, kids area with a/c, events room with a/c for adults with a rooftop and a garden, bathrooms with showers and dressing rooms for men and women. Amenities: jogging route of 1 km, dog park, kids playground, parking for 50 cars. Closed community with 24hr security. Price starting from 1265000 MXN.